One of the biggest issues with using weather apps or relying on the weather forecast from TV stations, is inaccuracy. These apps and weather reports are derived from weather stations situated in predetermined places, often miles from where you live, and they sample things such as humidity and temperature changes around those stations. As a result, you may not get a weather forecast that you can count on. In some cases, an unreliable weather forecast is not enough. If you need to know how the weather will be – and what it is doing – in the immediate vicinity of your house, what you want is a home weather station. Fortunately, there are more options on the market right now, especially with more and more weather enthusiasts looking for capable solutions as part of their hobby. Here are some of the best home weather stations you can buy for your house. These are the best of the best weather stations, no expenses spared. These have all the quality features you would want in your weather station. 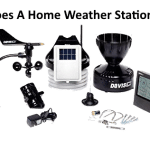 We really cannot talk about home weather stations without starting our list of reviews with a product by Davis Instruments. 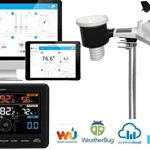 The company is behind some of the most remarkable weather stations on the market and is often the go-to brand among enthusiasts and even business users. 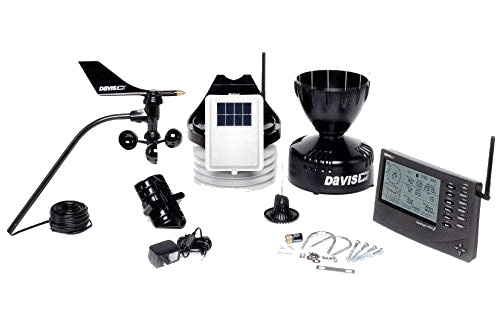 ​The Davis Instruments Vantage Pro2 is at the top of our list when it comes to the best weather stations for home users. The Vantage Pro2 is far from being a basic model. In fact, you will spend a bit more time getting the unit up and running due to the many sensors and modules included in the kit. It is an extensive kit indeed. It includes indoor and outdoor temperature and humidity sensors, along with sensors for wind speed, wind direction, rainfall, and barometric pressure. It doesn’t stop there. There is also a display console and support for both a wired and wireless connection. The Vantage Pro2 is one of very few home weather stations that still support wired connections to its main console. There is also the Vantage Pro2 Plus, which includes UV and solar radiation sensors as standard. ​[FAQ]How do I install a Home Weather Station? ​It is not overly difficult but there are a few things to watch out for, see our full guide here - How to install a home weather station? ​​[FAQ]​Are Home Weather Station Accurate? ​The short answer is, it depends on the brand/model but read our in depth guide here. ​​​[FAQ]​​How do Home Weather Stations ​work? ​It is a combination of thermometers, hygrometers, anemometers and lots more technology rolled into one device. They really are interesting and complex machines. To read more about how exactly ​home weather stations work, read our guide. The Davis Instruments 6250 Vantage Vue, or the Vantage Vue for short, offers good accuracy like the Vantage Pro2, but without the hefty price tag or the complicated setup. The system is designed to be simpler and friendlier to home users. It uses a 5-in-1 sensor kit that you can set up in minutes. While the Vantage Vue is very accurate, it is not as flexible as its more expensive brother. For starters, you don’t have the option to add more sensors to the system, so you are stuck with the five sensors you get out of the box. You also still need to buy additional hardware to add internet connectivity to the kit. In exchange for that slight loss of flexibility, Vantage Vue offers immense reliability. Users who have opted for this kit have reported how the Vantage Vue has remained reliable and highly accurate for years after it was initially set up. It is certainly more than just a cheaper alternative to the Vantage Pro2. 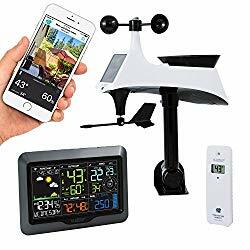 If you're not ready to commit to the big bucks of the professional weather stations then this section may be for you, these weather stations are the best trade off between price and features. You don't spend a fortune but you still don't lost most of the features you would find valuable. Check them out below. The WS-2902A Osprey by Ambient Weather is another great kit to choose, this time because of its incredible price-to-performance ratio. Available at ​reasonable price, the Osprey is the most valuable home weather station you can get right now. It is certainly not lacking in features and capabilities compared to its rivals. For starters, the WS-2902A Osprey is very easy to set up. Everything is wireless, and you can get the weather station up and running in no time at all. There is even a solar-power Wi-Fi connectivity to help you get the station connected to your home router. The Osprey comes with Ambient Weather’s own cloud service, AmbientWeather.net. Once connected, you can use the included display console to monitor the weather or rely on the cloud service to access your weather information from anywhere. The kit itself isn’t expandable, but you can add more Ambient Weather stations to your cloud account for better, more accurate weather readings. The Ambient Weather WS-1002-WIFI OBSERVER is released as an answer to the 6250 Vantage Vue. It is a more affordable alternative to the WS-2902A Osprey, but don’t think for a second that it is less capable. The home weather station is still a capable Wi-Fi enabled station that connects to the cloud wirelessly. 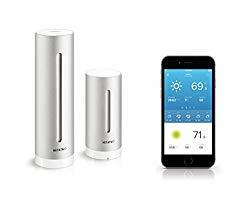 For the lower price, you get a complete set of indoor and outdoor temperature and humidity sensors, along with wind speed and direction sensors. It also comes with sensors for rainfall and barometric pressure, plus it has built-in UV and solar radiation instruments. The entire kit comes in a nice package, making installation a breeze. The only issue with the WS-1002-WIFI OBSERVER is build quality. Since it is designed for a lower-tier market, build quality isn’t up to par with its more capable counterpart. For home use, however, the WS-1002-WIFI OBSERVER is more than capable of delivering accurate weather readings. 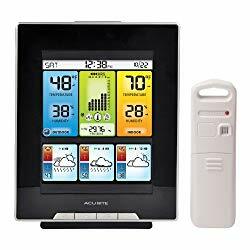 AcuRite’s 01024 Pro is one of the most popular home weather stations on the market right now, and it is so popular for many good reasons. Aside from a complete 5-in-1 sensor kit, the device also comes with its own lightning detector. The 01024 Pro is also the most expandable station you can buy for home use. Beyond the 5-in-1 sensor, you can add additional instruments directly to the sensor unit. The included display console will adjust readings based on the instruments you add. There is also a mobile app that enables mobile weather monitoring through AcuRite Access. There have been reports of minor accuracy issues with the AcuRite 01024 Pro, mainly due to the fact that the basic kit doesn’t come with radiation shielding. You may also find calibrating the barometric sensor to be a bit of a challenge, particularly when you are giving it a go for the first time. Next, we have the Netatmo Weather Station. From the design of this product, it is clear that the Netatmo Weather Station is built for home use. Netatmo itself isn’t a company with a long history in building weather stations. It is more known for its smart home appliances and sensors. However, the Netatmo Weather Station has a lot to offer. For starters, the unit is designed to be flexible. You get a home or base station to place inside the house. There are indoor and outdoor temperature and humidity sensors that connect wirelessly to the base station. The outdoor sensor also has a barometric pressure sensor with accurate readings. As for the indoor unit, you get a CO2 concentration meter and a sound meter. There is no display console included in the kit. This is because you monitor the weather and readings from your sensors using the native mobile app from Netatmo. It even supports integration with other smart home units, so you can build a complex system and add more sensors if needed. Just make sure you watch how much you spend, because the additional sensors are expensive. 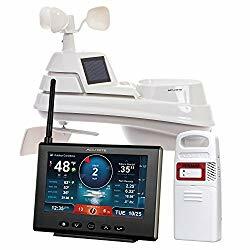 If your interest in weather stations is just casual, or you are just beginning then I recommend trying out one of the below, they are more cost effective and will suit your needs. If you are a more serious shopper then I would stick to the above options. We are entering the entry-level category at this point, and La Crosse Technology is a king in this market segment. The company has been building home weather stations for so long that it has gotten very good at it. The 330-2315 Professional is no exception. The La Crosse Technology 330-2315 Professional comes with everything you would expect from a home weather station kit. 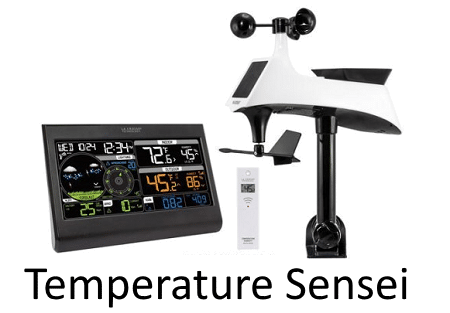 You get wind speed and direction sensors, along with sensors for temperature and humidity (both indoor and outdoor), rainfall, barometric pressure, and dew point. Being an entry-level model, the 330-2315 Professional unfortunately cannot be expanded. However, you get accurate readings with the sensor included in the kit. You even get features like connectivity with Weather Underground, which is something that only higher-tier stations normally offer. Even the display console looks cool, despite the dim screen causing existing users to complain. Another product in this market segment is the AcuRite 02007 Digital Weather Station. One thing you will immediately notice about the Digital Weather Station is how easy it is to set up. There are no complex sensors to figure out, only a bundle already preconfigured and a display console for monitoring the weather. The model also only includes three main sensors for measuring temperature and humidity (indoor and outdoor) and for monitoring barometric pressure. Despite the limited sensors, the AcuRite 02007 Digital Weather Station can still produce accurate readings. AcuRite even included a 12-hour forecast feature as a bonus. Affordability is where AcuRite 02007 Digital Weather Station stands out. The starter kit costs no more than $50, so it is an easy investment to make. Even with the optional temperature and humidity solar radiation shield, buying the 02007 Digital Weather Station is still an incredible investment to consider. The radiation shield is highly recommended though, because it substantially improves the accuracy of this kit. 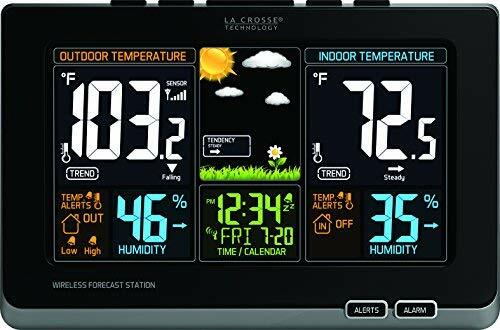 Another product by La Crosse Technology that you want to consider if you are looking for a straightforward entry-level home weather station is the La Crosse Technology 308-1414B. The 308-1414B is the kind of device that you don’t need to set up to get working. It is an all-in-one unit that works right out of the box. Still, you get the usual indoor and outdoor temperature and humidity sensors along with a dew point sensor. You get straightforward readings from these sensors on the screen and you can view the weather forecast based on the current condition. As an added bonus, La Crosse Technology adds an atomic clock to the 308-1414B. Similar to the AcuRite 02007, the La Crosse Technology 308-1414B also costs less than $50. There is an optional sensor protection shield with mount designed to work with the 308-1414B, and – once again – it is a highly recommended option to get. The La Crosse Technology 308-1414B suffers from accuracy issues without the radiation shield. There is one more product that you want to consider if you are looking for a capable home weather station, and that is the Kestrel 5500 Weather Meter. 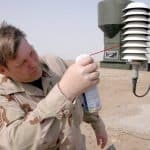 Kestrel is a household name in the portable weather meter market, so you know you are getting the best even before you start listing other features included in the Kestrel 5500 Weather Meter. Trust me, there are a lot of features to go through. For starters, the Kestrel 5500 comes with built-in temperature and humidity sensors. It also measures wind speed and direction, barometric pressure, and dew point. When you take into account the size of this weather meter, the wealth of sensors you get is nothing short of incredible. 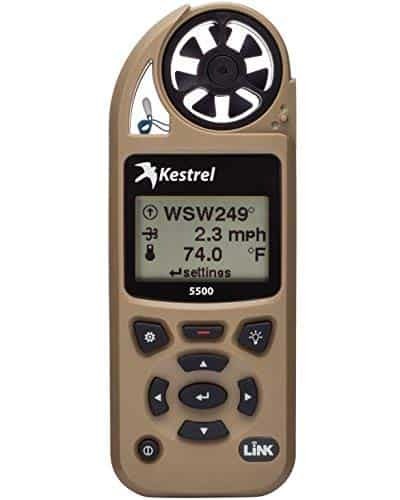 The Kestrel 5500 Weather Meter also displays heading – both true and magnetic – and altitude. There is a reason why the Kestrel 5500 is a favorite among those who spend a lot of time outdoor, and these features are among them. The unit is no bigger than your standard outdoor GPS navigation device. You also get native LiNK apps for your computer and mobile devices. After connecting your Kestrel 5500 via Bluetooth, you can monitor the weather and get forecasts in real-time. ​So, which of these home weather stations is the best? The answer depends on your specific needs and requirements. Davis Instruments Vantage Pro2 leads with its long list of features and sensors, but the kit is relatively expensive and is certainly not for everyone. The Ambient Weather WS-2902A adds built-in Wi-Fi and good value to the mix, but you still have a lot of sensors to install. La Crosse Technology 330-2315 Professional wins the entry-level category, but you have to keep its limitations in mind before deciding to get one. Yes you're right, finding the best home weather station for you is actually difficult. The best way to decide which one to get is by understanding your needs and finding a kit that fulfils those needs best. With any of these products, you know you can get accurate readings and good weather forecasts to use. Don’t forget to consider deals and special offers on these best home weather stations before hitting the Buy button. 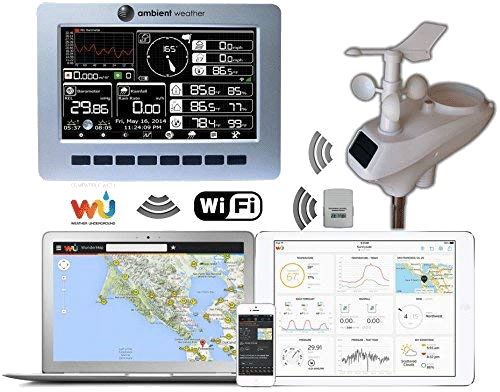 With the demand for weather stations being as lively as it is today, there are plenty of special offers and discounts to benefit from. The best home weather stations are a useful source of data if the weather forecast is important to you. However, it is very important that you choose the right one, or you could end up wasting your money. There are several factors you need to consider before you buy. 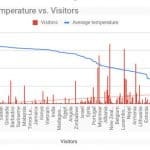 Climatologists use a range of data to formulate their weather predictions. Firstly, they look at historical data to compute averages for the period being analyzed. This works great if the weather is typical for the time of year, but it is less successful if there are unusual weather patterns. They also use sophisticated computer programs that take data from sensors in different locations. Data collected typically includes rainfall, temperature, humidity, wind speed, etc. The computer uses the data to predict what the weather will be. The more data the computer has to work with, the more accurate the weather forecast is. This method is known as Numerical Weather Prediction. 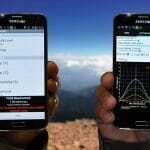 ​The best home weather stations collect the same data, but on a smaller scale. They check barometric pressure, rainfall, humidity, wind speed and direction, outside temperature, and wind chill factor. Some also check the temperature indoors and UV levels. Regular home weather stations will check all of the above. If you need a specialist home weather station, for example, if you are running a farm, there are units that have extra features, such as soil temperature and moisture sensors. Check the measuring capabilities of any of the best home weather stations you are considering. Does it meet your requirements? Remember that the more features a home weather station has, the more expensive it will be. So, don’t spend more than you need on features you won’t necessarily need. There are two types of home weather station: cabled and wireless. Wireless models are newer, but there are pros and cons to each type, so don’t assume that wireless home weather stations are always the better option when on your search for the best home weather station. Cabled home weather stations usually have a limited number of sensors. If you think you might want to expand your home weather station by adding extra sensors at some point, a cabled model isn’t the best choice. Also, a cabled home weather station is more suited to a smaller area, as cables have a finite length. Bear in mind also that long cable runs will probably need to be buried in a conduit, either in a wall or underground; this is an added installation expense. Wireless home weather stations offer a higher degree of flexibility. You can add more sensors as and when required and transmit weather data over greater distances (more than 250 meters if you use repeaters). The downside of using a wireless unit is that signal interruptions may occur. Wireless radio signals don’t always travel well through solid walls and metal objects. ​All the best home weather stations need power. Most have battery backup systems in case of an interruption to the mains power supply. Some models also have alternative power supplies, such as solar. This may be handy if you live in a remote, sunny location. Most good home weather stations are not difficult to set up in your home and you shouldn’t need any specialist knowledge to get yours up and running. Look for a unit that comes with comprehensive instructions, fixtures and fittings, and telephone support, just in case you get stuck. Fitting external sensors is pretty easy, but if you intend to fit sensors to a mast or somewhere at height, bear in mind you may need to hire a specialist installer, check out la crosse technology for more information on that. Decide in advance where you want to site your sensors. It is handy to have a plan drawn up before you start the installation. Think about access and whether you need to bury cables (if applicable). Data is transmitted back to the console. 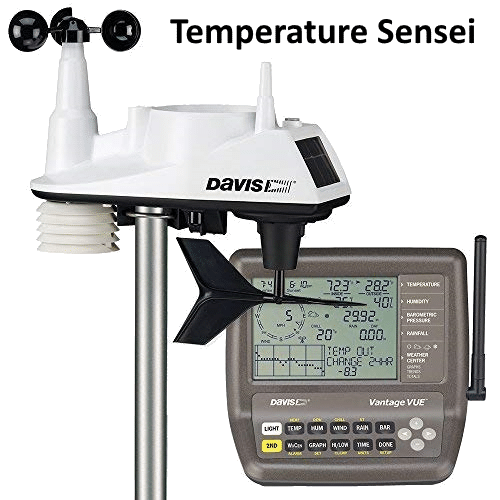 Depending on which davis instruments model you purchase, you should be able to view current as well as historical data. Some home weather station models have graphs and other visual tools to make the data easier to digest. If you are keen to do more than view the day’s weather data, look for a model (maybe the ambient weather ws) that offers a computer interface. This lets you download data from your weather station and analyze it and/or upload it to a weather site. It’s a useful option if you want to maintain weather records over time. Check whether the model offers automatic data transfers. That way, you can leave your computer on and the home weather station will upload data at set intervals each day. You can then view the data remotely, via an app or computer interface. It should go without saying that it is sensible to read as many reviews as you can before you buy a home weather station. Look for unbiased reviews on consumer websites, as reviews on the manufacturer’s own website may not be a genuine representation of consumer opinions. ​For further reading I suggest our review on the Ambient Weather WS-2902.